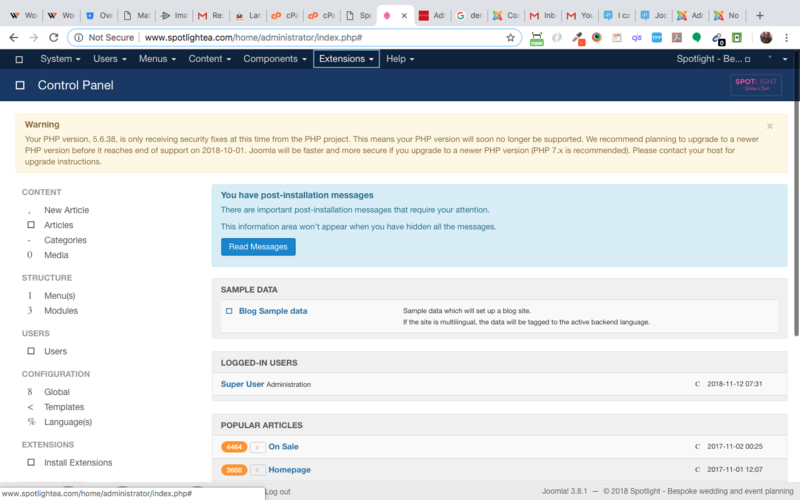 I am from migrating a joomla website from server A to my server B but i other parts of the website work fine but my administrator side or backend has the following issues. As one commenter suggested, try clearing your browser cache and the Joomla cache and see if that fixes the problem (also try restarting your browser and restart your Internet modem). If that doesn't fix the problem, then open the Chrome console when in the backend (press F12 and then click on console in your browser), and see which files are returning a 404. Once you make a list of these files, check their permissions (and their parent folders' permissions) and ensure that they can be read by the Apache server. If that also doesn't work, then re-upload these files. Note that when you move a website from one server to another, you might have transient issues like this one which will resolve themselves once DNS propagation is complete. Not the answer you're looking for? Browse other questions tagged joomla-3.x php joomla-3.4 joomla-3.3.x joomla-3.6 or ask your own question.